A generation of music fans became familiar with Jonathan Richman through his work as the front man of ’70s punk pioneers The Modern Lovers — the band that also launched the careers of Jerry Harrison (Talking Heads) and David Robinson (The Cars). Nearly thirty years later, songs such as Roadrunner and Pablo Picasso are still performed as punk rock staples. After The Modern Lovers split up, as lovers are apt to do, Richman launched his solo career with a quieter, more romantic sound — often just strumming a guitar and singing with a single snare drum behind him. In 1998, the Boston native finally pierced the consciousness of mainstream society when he played the on-screen musical interludes in There’s Something about Mary. In many respects, Richman’s career has paralleled that of Lou Reed — a fact that isn’t all that surprising when one considers that it was the Velvet Underground that inspired Richman to form The Modern Lovers in the first place. Reed and Richman both went on to have successful solo careers even though both share limited vocal ranges. Both gentlemen succeed in spite of their monotone deliveries largely because they focus on thoughtful songcraft, memorable hooks, and intelligent lyrics. However, while Reed’s solo work often can be dark and morose, Richman opted for quirky and romantic. 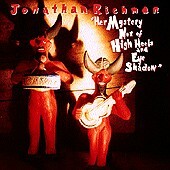 Nevertheless, Richman has, at times, challenged the loyalty of his fan base with off-kilter releases such as Jonathan Goes Country and the all-Spanish Jonathan, Te Vas a Emocionar. Between 1988 and 1995, Richman recorded seven albums for the Rounder label, and while there were many tasty treats among these discs, none of the albums could be described as a definitive, desert island favorite. 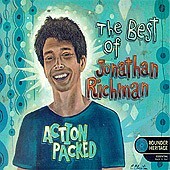 At long last, the search for the perfect Jonathan Richman disc from this era has been solved with the release of Action Packed: The Best of Jonathan Richman, a collection of songs that adequately captures the soul and poetry of a true American troubadour. The 22-track album begins with Richman celebrating the 1950s doo-wop music of his youth in songs Circle I and New Kind of Neighborhood. In Fender Stratocaster, Richman fights to keep his vocals on pace with the staccato rhythm of the drums and frantic guitar, as he presents a beautiful ode to the instrument that has served him so well. He shows off his wit in the funny live tracks When I Say Wife and She Doesn’t Laugh at My Jokes as well as the classic I Was Dancing in the Lesbian Bar. Even the best Latin and country tracks from his experimental releases are salvaged on this compilation. There are moments, however, when Rounder reached a little bit too deep into the Richman catalog, most likely to increase the number of tracks on this collection. A few of the cuts should have remained on the chopping block, including the misfire Cappuccino Bar and the painfully long and irritating Monologue about Bermuda. Thankfully, at fifty-one years of age, Richman is still making good music as evidenced by his latest studio release Her Mystery Not of High Heels and Eye Shadow. The album is a terrific collection of original songs that dig deep into his romantic, worldly side. He pays tribute to some of his favorite cities in Springtime in New York and Give Paris One More Chance; both tunes could easily be used in television spots to promote tourism. Couples Must Fight is a sweet, fatherly advice song by a guy who has clearly been down that road. In addition, the instrumentation on this release shows Richman paying more attention to orchestration than he has in the past. He even goes so far as to employ a string section and several different layers of guitar sounds, particularly on the four Spanish language tracks. And, interestingly enough, the final song on the album is Vampiresa Mujer, an Español version of his goth-girl send up Vampire Girl, which appears in English on the Action Packed collection. People who liked what they heard in There’s Something about Mary and want to check out some more from that funny-looking guy would do well with either of these releases. When taken in its entirety, Action Packed: The Best of Jonathan Richman is a terrific retrospective of an underappreciated performer who deserves more attention from the mainstream, and Her Mystery Not of High Heels and Eye Shadow exhibits a talented artist who is still growing after all these years. Action Packed is available from Barnes & Noble.